The Quayside in Gourdon, Aberdeenshire say fresh ingredients won them the nomination. A fish and chip shop in Aberdeenshire is hoping to collect the top prize at the National Fryer awards. The Quayside Restaurant and Fish Bar is the only Scottish nominee to be put forward for the 'Best Fish and Chip Restaurant' category. With the National Fish and Chip awards around the corner - this Gourdon chippie is hoping to take home the top prize. 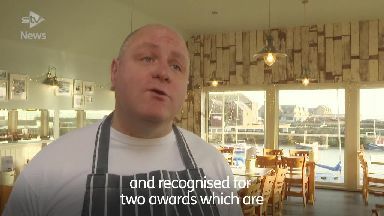 "It's the equivalent of our Oscars and we've been nominated for two awards, the best fish and chip restaurant and the best fish and chip campaign," said owner Noel Brown. Part of their campaign was to encourage school pupils to eat more fish. The Quayside is the only Scottish restaurant to be shortlisted for this award category . Noel puts the nomination down to the fresh ingredients they use. "It's all about the produce. We use what's called top-grade fish from Peterhead, which is Europe's largest whitefish market," he said. "We buy something called top-of-the-shop fish which is the last fish that come into the market so it's the freshest. "On top of that we fry in beef drippings to give it a traditional taste and it's a great batter. 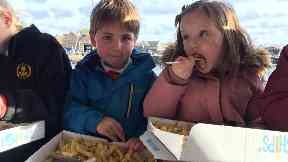 "We twice cook our chips to give them the best flavour and the potatoes are good quality." The team will travel to London on Thursday to see if they've won the coveted prize.